The Money and Banking Statistics released by the Bank of Namibia this week Tuesday offers more than a glimmer of hope for the economy, albeit traction is still slow with only a hint of expansion. These figures cover the period up to May this year. While the improvements are not staggering, with the exception of only three sub-categories, all measurements applied by the central bank indicate an economy on the mend. For May, there was a slight decline in foreign reserves of N$300 million to N$25.4 billion. This is only a whisker away from the peak in December 2015 and above the average for 2016. It indicates that the foreign reserves position has not changed materially since the issuance of the $750 million Eurobond in October 2015. It also indicates a fairly stable external credit position. 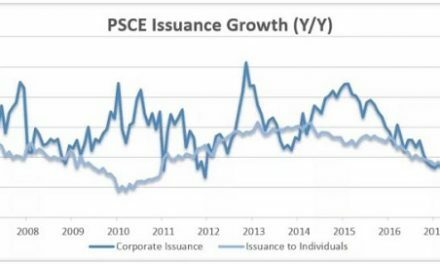 Private Sector Credit Extension, or so-called PSCE, is what caught my eye. This is the thermometer of the Namibian economy and any substantial future growth in output depends on improved current credit conditions. Overall, PSCE only rose moderately by 0.4 percentage points to 8.5% from a month earlier, but the year-to-date data also shows a stable environment. What is exciting is that the biggest demand for credit came from businesses and not from households. In fact, credit to private individuals is the only PSCE sub-category that declined. From 8.7% annual growth at the end of April, it came down marginally to 8.5% at the end of May. I would not concern myself too much with this small retraction as it is probably the tail-end of a period of almost two years when households battled to align their commitments with their incomes. I think we shall see sustained improvement in this category for the second half of the year as the pressure on disposable incomes is relieved by savings and by reducing debt. All in all, it is always a good sign when households consolidate their debt. It shows the bank’s monetary policy is working. A substantial comeback shows up in the data for credit extended to businesses. Although still only registering an 8.4% growth compared to a year ago, on a monthlly basis it improved by a healthy 1.2 percentage points, up from a historically low 7.2% in April. 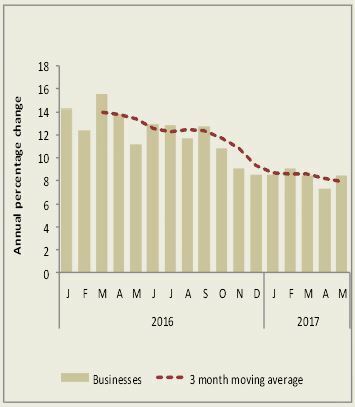 Perhaps the surest indication of renewed business confidence is in the types of credit with overdraft facilities rising a healthy 17.3% against the 12.3% of April. The Bank of Namibia stated that various sectors borrowed to finance various projects leading to an increase in demand for short-term financing. Another very positive sign is the overall liquidity of commercial banks which increased to N$3.3 billion at the end of May 2017, from N$1.8 billion at the end of April 2017. This significant growth is ascribed to diamond sales and to the capital injection by the GIPF when it acquired shareholding in Capricorn Investment Holdings. Overall improved conditions are also reflected by the so-called Broad Money Supply which grew by 6.6% in May, year on year, when at the end of April, annual growth was a paltry 3.5%. “The rise in M2 was due to an increase in domestic claims in the form of credit extended to the private sector during the review period” according to the central bank, which is a bit of a tautology, but I am happy to go with the overarching view that credit and liquidity are both improving. If this trend is confirmed by the end-of-June data and inflation keeps coming down, then I believe we have, for the first time, tangible indications that the financial backbone is intact, and growing. I could find only one really worrying signal and that is the continued arrest of the momentum in mortgages which slowed again on a monthly basis. This may be indicative that banks are not yet willing to change their narrative on large tickets, but is also may just indicate that property is overpriced and that the property market is in the middle of a correction. Depending on whether you buy or sell, it may be good or it may be bad. With stellar increases in property prices over the past five years, it is plain and simple economic common sense that the bubble had to burst, or at least deflate but with painful consequences mostly to individuals. While I am not saying that the Namibian economy has resumend a solid growth path, I am certainly stating that we have moved far into the consolidation phase. It is a high risk game to make dogmatic predictions about how fast the economy can grow during the second semester, but it looks like we have turned the tide and will now gradually recover. The latest Money and Banking Statistics offer a first glimpse of that turn-around which up to now had to be assumed or based on anecdotal evidence. Once the upward momentum start showing up in the official date, it is a fairly reliable signal that the economic wheels are turning again.